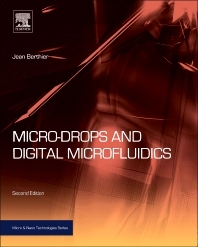 In this 2nd edition of Micro-Drops and Digital Microfluidics, Jean Berthier explores the fundamentals and applications of digital microfluidics, enabling engineers and scientists to design this important enabling technology into devices and harness the considerable potential of digital microfluidics in testing and data collection. This book describes the most recent developments in digital microfluidics, with a specific focus on the computational, theoretical and experimental study of microdrops. Unique in its emphasis on digital microfluidics and with diverse applications ranging from drug delivery to point-of-care diagnostic chips, organic synthesis to microreactors, Micro-Drops and Digital Microfluidics meets the needs of audiences across the fields of bioengineering and biotechnology, and electrical and chemical engineering. Authoritative reporting on the latest changes in microfluidic science, where microscopic liquid volumes are handled as ""microdrops"" and separately from ""nanodrops."